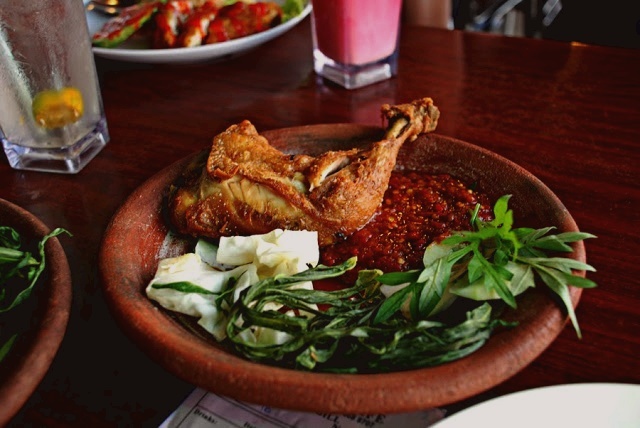 Ayam penyet is an Indonesian dish fried chicken, lightly smashed, normaly served with rice, raw salad as a side dish, super hot sambal chilli and lime. Ayam Penyet is popular among Singaporeans in the early 90s till now, made popular by Indonesian restaurants in Singapore namely Ayam Penyet Ria which is located in Lucky Plaza. 6 pieces chicken thighs (rinse and drain well, do not throw the skin). Combine all ingredients in pot except for chicken and oil. Mix well and taste. Add chicken with enough water to cover the chicken. Place pot on stove. Cook over medium heat for 15-20 minutes until chicken cooked. Take meat out. Drain and cool it. Strain the soup. Clear broth will be used for soup. Use the remaining strained cummin and coriander seeds to marinate the chicken. Add a little broth to the boiled and cooled chicken. Store it in the fridge. Deep-fry chicken in oil over medium heat till cooked through and lightly golden brown. Drain in a sieve lined with paper towels. Smash the chicken thigh with a wooden mallet. To serve: Spoon a bowl of Jasmine or Chicken rice on a plate. Garnish the rice with spring onions or coriander. Place one chicken thigh, 2 slices fried tempeh, 2 slices fried beancurd, some salad and sliced cucumber onto the plate and drizzle some kalamansi juices over them. Spoon sambal assam onto the side of plate. Fill a small bowl with the chicken soup. Description: Quick and easy to make recipes, with ingredients you can find at any supermarket. I already add your link in my blog. I hope we can be link buddy.Thank you.